Tokyo, Japan, November 6, 2015―At a press conference today, Toyota Motor Corporation announced it will establish a new company, Toyota Research Institute Inc. (TRI), as an R&D enterprise with an initial focus on artificial intelligence and robotics. The headquarters will be located in Silicon Valley near Stanford University in Palo Alto, California, U.S.A. A second facility will be located near the Massachusetts Institute of Technology (MIT) in Cambridge, Massachusetts, U.S.A. The new company will begin operations in January 2016. Toyota believes artificial intelligence has significant potential to support future industrial technologies and the creation of an entirely new industry. To underscore this belief, it is making an initial investment of $1 billion over the next five years, to establish and staff the two initial locations and conduct operations. The investment is in addition to the $50 million investment over the next five years with MIT and Stanford to establish joint fundamental artificial intelligence research centers at each university. TRI will help bridge the gap between fundamental research and product development. Its primary mission is to accelerate R&D in a range of fields to help resolve society's future challenges by using artificial intelligence and big data. Thereby, contributing to a sustainable future where everyone can experience a safer, freer, and unconstrained life. 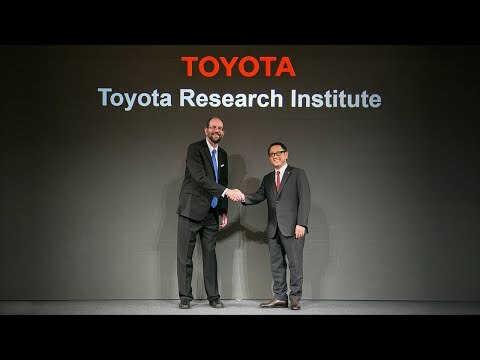 Directed by Dr. Gill Pratt, Toyota's Executive Technical Advisor and the Chief Executive Officer of the new enterprise, TRI will hire leading researchers and engineers to support its wide range of activities. Dr. Pratt said, "Our initial goals are to: 1) improve safety by continuously decreasing the likelihood that a car will be involved in an accident; 2) make driving accessible to everyone, regardless of ability; and 3) apply Toyota technology used for outdoor mobility to indoor environments, particularly for the support of seniors. We also plan to apply our work more broadly, for example to improve production efficiency and accelerate scientific discovery in materials." Akio Toyoda, President of Toyota Motor Corporation, said, "As technology continues to progress, so does our ability to improve products. At Toyota, we do not pursue innovation simply because we can; we pursue it because we should. It is our responsibility to make life better for our customers, and society as a whole. I want to work with Gill, not just because he is a great researcher, but because I believe that his goals and motivations are the same as ours." $1 billion / 5 yr.
Born in the U.S.A. in 1961. Obtained a Doctorate degree from the Electrical Engineering and Computer Science department at MIT, and taught at MIT and Olin College as Associate Professor and Professor, respectively. Established three startups between 1983 and 2005, and helped found Olin College. As a DARPA Program Manager, led projects in Neuromorphic Systems and Robotics, including the DARPA Robotics Challenge, from 2010 to 2015. Significantly influenced robotics research by leading the DARPA Robotics Challenge, where humans and robots collaborated for disaster response. Thank you very much for taking time out of your busy schedules to join our press conference. Today I am happy to announce that in January of twenty-sixteen, we will open a new company in the U.S… the Toyota Research Institute, The focus of the institute initially will be the research and development of artificial intelligence. Dr. Gill Pratt, who joined Toyota in September, will serve as CEO of the new entity. He is well known as a program manager for the DARPA Robotics Challenge. "Why are you joining Toyota?" He said, "I want to contribute to making society better." Gill told me that AI can reduce traffic accidents, but it cannot completely eliminate them without human input, and it is essential that people and machines collaborate to create a truly safe and secure mobile society. This collaboration is important also outside the mobility field. AI has significant potential to further improve all of society. This response, from one of the best known AI researchers, was exactly the same as Toyota's founding principle. As technology continues to progress… we will be able to further improve our products. But at Toyota, we don't pursue innovation simply because we can… we pursue it because we should. It will be possible to create a new industry by combining AI and big data. Beyond mobility, with these technologies, we want to contribute to make life better for our customers, and society as a whole. We use innovative technologies like AI to make society ever better, safer, more pleasant and promising… today, tomorrow… and the next 100 years. I want to work with Gill not just because he is an amazing researcher and engineer, but because I believe that his goals and motivations are the same as ours. When he showed me this picture of him doing a brake job on a Corolla thirty-five years ago, I really really wanted to work with him! But seriously, I believe Gill will be a great asset for us. Several months ago I began talking to Toyota Motor Corporation executives about their desire to accelerate innovation in artificial intelligence and robotics. At first I thought they simply wanted to be more competitive with other automakers and companies becoming more active in the field. But with every meeting my eyes got bigger as I heard the incredible scope of their goals. The higher up in the company I went, the bolder the goals became, and I realized the importance of what Toyota wanted to accomplish. The purpose of TRI is to bridge the gap between fundamental research and product development of life-saving and life-improving technologies. TRI will focus first on collaborative autonomy and artificial intelligence―the way people and machines can work together, particularly in the area of mobility. Our safety goal is to make driving much safer by preventing cars from being involved in an accident regardless of a driver's actions. Our accessibility goal is to enable every person to benefit from the mobility of cars, regardless of their demographics and physical challenges. And finally our robotics goal is to improve the quality of life for all people, and in particular to allow seniors the dignity of aging in place, in their own familiar homes, regardless of age or infirmity. Now, I would like to talk a bit about myself and where my motivation comes from. My father immigrated to the United States in the 1950s. His first job was on a Ford assembly line in Edison, New Jersey. He spent his evenings earning degrees in chemical engineering and environmental engineering, with a specialty in air pollution. I learned about engineering, how cars worked, and how air pollution controls worked, from him. Like most kids, I watched TV when I came home from school. "Gigantor" was my favorite, a dubbed version of the early Japanese Anime Tetsujin Ni Ju Ha Chi-go―a giant robot controlled by a little boy. I really wanted to build one someday. I was fortunate to go to high school near Bell Telephone Laboratories, which had a special program for students who wanted to spend one evening a week under the mentorship of some of the world's top scientists. I ended up working at Bell Labs during my summers in college in the Physics and Computer Science divisions. At Bell Labs I learned how really smart people think, and how really great management created the crown jewel of research laboratories in the United States. I went to MIT for 21 years, starting as an undergraduate and ending up as a junior professor of Electrical Engineering and Computer Science. As a hobby I designed power electronics for the MIT solar powered car. While I was a professor at MIT I worked on walking robots under funding from DARPA. As you might imagine, these robots bore some resemblance to Tetsujin Ni Ju Ha Chi-go, although unfortunately they didn't have jet engines and couldn't fly. In 2010, I decided it was my turn to give back, and work as a Program Manager at DARPA. I was working at DARPA on March 11, 2011 when the Earthquake and Tsunami struck. I spent the next week on the phone with robotics companies DARPA previously funded evaluating radiation resistance and helping them get their robots―the Packbot, Talon, and Thunderhawk―to Fukushima. Unfortunately, we were not successful before the explosions occurred. This failure inspired us to create the DARPA Robotics Challenge, a three year $100M program to develop robots that could work as partners to human beings to lessen the extent of a disaster. Because of my experience at MIT with Japan's strong work in robotics, I spent a great deal of time shuttling between Japan and the U.S. with colleagues negotiating an agreement to collaborate in disaster robotics. We were successful in those discussions, which resulted in significant investment by the Japanese government. A Japanese team won first place in the second phase of the challenge, and five Japanese teams competed in the third phase. The DRC was an important milestone for the field of robotics. I'd like to tell you now about three very difficult events in my life, and how they relate to the work I plan to do at TRI. First, when I was in grade school, I came across a fatal accident. A boy riding a bicycle ended up in the street where he was struck by a car and killed. I still remember the terrible scene, including the driver, who was sitting with his head in his hands while the emergency personnel tried in vain to revive the boy. It was a moment I would never forget. Second, when my father reached the age of 83, my sister and I had to take away his car keys - a terribly disappointing day for him and for us. Third, when my father was 84, he had to be moved to a nursing home. TRI's three goals in Safety, Accessibility, and Robotics ring true to me because of these three events in my life, and we will work towards making these kinds of difficult events less likely for families around the world. This is just the beginning and I can't accomplish this alone. I want to make ever-better-cars as a member of Toyota and improve the quality of life for all people through mobility technology. Toyota sells approximately 10 million vehicles a year- 100 million in ten years. If each of them runs 10,000 km a year, that totals 1 trillion km per year of potential real-world data. Data which could be collected from Toyota vehicles driving in variety of conditions all over the world will be a key for us to accelerate the evolution of future technology. On the other hand, the cumulative miles driven and geographies show how difficult it will be to ensure reliability. With Toyota's bold motivation and large scale, I see the potential improvement that AI can bring to quality of life and society. I've spoken about the application of Artificial Intelligence in Cars and Robotics. AI can also be applied broadly to help society. For example, AI can be used to schedule cars, manage traffic, deliver goods, schedule the operation of a factory even beyond Toyota's famous production system, and accelerate scientific discovery in materials and environmental technology. TRI will aim to develop technology for these and other applications, expand Toyota's boundaries, and positively impact society. I think Toyota will contribute to society by transforming from a successful hardware company to a new company, by integrating software technologies, this is why I joined Toyota. Last week at the Tokyo Motor Show, Toyoda-san spoke about stepping up to the plate and meeting challenges head on, taking full responsibility without making excuses, no matter what happens. It's my time to step to the plate. I believe taking on these challenges gives us the power to change the world. I can't wait to begin. Thank you very much. Arigato gozaimasu.